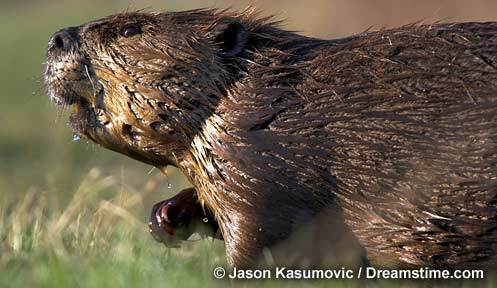 The beaver is the largest North American rodent, ranging in weight from 30-100 pounds. Their large webbed hind feet are adapted for swimming, and their broad, flat, leathery tail serves as a rudder and propeller. Although their ears are small, beavers have excellent hearing. Beavers close their ears and nostrils while under water. Beaver teeth, including their bright orange incisors, grow continuously. Beaver occur across most of North America except on the peninsula of Florida, on the Arctic tundra, and in southwestern deserts. Trapping nearly eliminated beaver from New Hampshire by the late 1800's. Six beaver were released in the state between 1926 and 1930 as part of a restocking program. By 1955, the entire state was repopulated. Their numbers continue to increase locally throughout New England. Beavers are true vegetarians, eating leaves, bark, twigs, sprouts, fruits and buds of shrubs and trees, as well as aquatic plants such as sedges and rushes. Preferred woody plants include alder, aspen, birch, maple and willow. Small diameter stems (<3") are most heavily sought. Beavers typically feed within 100 yards of the edge of a pond. When beaver start gnawing on larger softwoods and less favorable hardwoods, or travel long distances to feed, it is indicative of a dwindling food supply. About 200 aspens support one beaver for one year. Beaver cache food for the winter, submerging tree and shrub branches next to their lodge. Beavers are usually nocturnal but they may be seen at dawn and dusk making repairs to their lodge or dam or gathering food. Beavers live in colonies which usually consists of an adult pair, the young of the year (kits), and the young of the previous year (yearlings). The number of beavers in a colony is usually five or six, but can be 12 or more. Two-year-olds leave the colony in late spring to establish new colonies of their own. Beavers are highly territorial. A colony marks its territory, using scent mounds, preventing other beavers from colonizing the area. They construct a large mound where scent is deposited or they deposit scent on small piles of mud carried from the stream bottom to the territory boundary. The territory of a beaver colony extends about 0.5 miles along a waterway. Beavers are monogamous and pair for life. Breeding occurs in winter with 3-5 kits born in May or June. Litter size may vary with the quantity and quality of food supply. Beaver do not breed until their second or third year. Older females (5 to 13 year olds) produce more offspring. Beavers dam small to large slowly flowing brooks, streams, or rivers, usually bordered by woodlands. 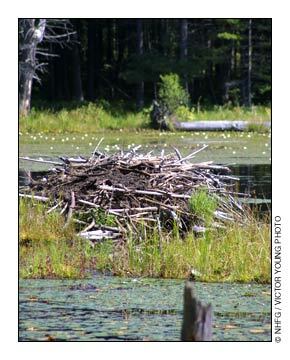 After beavers complete the dam, they construct a lodge in the deepest portion of the pond. If a stream is too large for a beaver to dam, they will build dens or lodges along the banks. An adequate food supply is essential for beaver colonization. Beaver will colonize an area, build a series of dams and lodges, harvest small trees within reach of the impoundment, then move on when food resources are depleted. An abandoned beaver pond will eventually return to the early successional stage of a brook and meadow. Beaver flowages are important habitat for many other species including great blue herons, osprey, kingfisher, mink, otter and muskrat. Management activities that encourage beaver also can improve waterfowl habitat, particularly for black and wood ducks. Patch cuts around mature aspen and birch near the edge of a wetland can regenerate food supplies and encourage beaver to return. The installation of beaver pipes is an effective way to control water levels and keep beaver from flooding valuable timber stands, roads, and other areas.